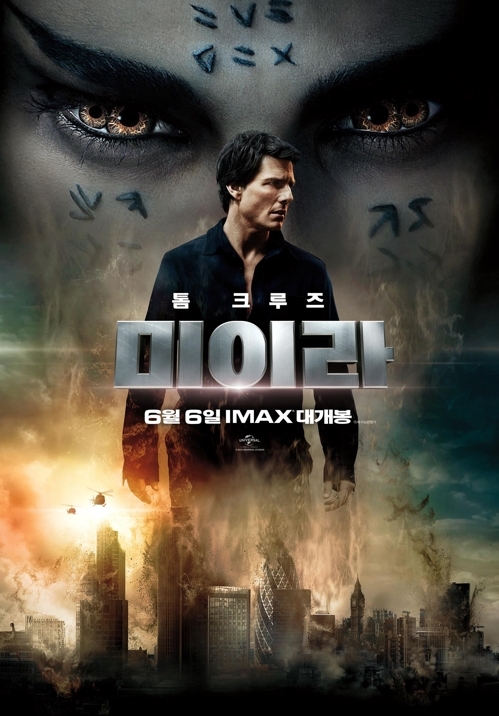 SEOUL, June 19 (Yonhap) — The Tom Cruise-led action blockbuster “The Mummy” has topped the South Korean box office for the second weekend in a row, data showed Monday. The movie added 498,303 viewers over the June 16-18 weekend to its domestic total of 3.24 million, according to the box-office tally from the Korean Film Council (KOFIC). The Korean time-loop thriller “A Day” came in a close second, selling 480,807 tickets. Directed by Jo Seon-ho and starring Kim Myung-min and Byun Yo-han, the movie is about two men who wake up to find themselves locked in what seems to be an eternal time loop where they repeatedly lose their loved ones in the same traffic accident. “The Villainess,” a Korean action flick starring Kim Ok-bin, was at No. 3, seen by 247,180 people. Directed by Jung Byung-gil, the movie centers on a young girl who is raised to be a deadly assassin. After being abandoned by her organization, she is recruited by South Korea’s state intelligence agency as an agent. But she seeks revenge after realizing the secrets and conspiracies surrounding her. “Wonder Woman,” starring Gal Gadot, fell one spot again to fourth place, selling 128,639 tickets. “Our President,” a homegrown documentary biopic of late former President Roh Moo-hyun, stayed in fifth place with 84,185 views.